I’ve been looking at that article since you gave me that issue when I first started. I’m so glad to finally be able to read it; please thank your friend Akira for all of us. There are pictures of some lovely flies in the article, do you know if they are the Gorocho fly mentioned in the article? Great stuff, and yes the hornet thing freaks me out, too TJ. Now that’s a man that lives in the moment. The last paragraph made me think of a late fishing buddy who used to say ” I like trout, they are only as smart as they have to be. We humans, we are too smart for our own good.” A universal thought. TJ, I experienced this hornet in Japan.Tthe first day, within an hour of starting, I was fishing Nagawa and I struck down one on accident with my rod while casting. It thunked hard and down into the water. It must have been flying close checking me out. I had asked Miwa-san the dangers of the area just before fishing, he told me about them, it was fresh in my mind and it scared me. It was large like a hummingbird, yellow and black. It was swept away by the stream. I had another one buzz me in Iga. Big is all I can say, a bit intimidating especially hearing how painful their sting is. More than a few people die from their sting each year, they are most common in rural areas according to the article that Daniel and I have cited. I am told they are attracted to certain colors. After I knocked it down I walked to the bank where I stepped next to a very large brown snake. All within five minutes and the first hour of fishing. In the next two weeks of fishing, I only saw frogs, fish and one salamander. Best to get the serious stuff out of the way first. I really hope you guys connect Daniel. Bring it back to us. I will ask my friends, I am sure Prof. Ishigaki and Sabata-san know. I did find this: http://educationinjapan.wordpress.com/fielding-field-trips/favourite-nature-activities-for-kids-in-japan/warning-beware-the-japanese-hornet/ that says dark colors. I think this is true as my pack is somewhat bright. May be another case for mosquito coil holder on your pack. Fumakilla red rooster on package. I would not worry about it. I would advise you to have your physician give you a prescription for a “Epi Pen” Tell him about the hornet. Better to have it and not need it. Seriously, if Sabata-san is concerned, Epinephrine could stop anaphylaxis while you are hiking back. What a wonderful article! Thanks for posting it Daniel. So many things worth contemplating about tenkara and being in tune with nature. Its wonderful to connect to the history behind my passion for Tenkara,thank you for the offering! On a more serious note – according to this web site ; their venom is less toxic than the venom of the honey bee. What makes their sting more dangerous is the quantity of venom they inject per sting. 30 Japanese hornets massacre 30,000 bees. (Vespa mandarinia japonica) is a subspecies of the Asian Giant Hornet. .. In Japan it is known as the ōsuzumebachi (オオスズメバチ（大雀蜂、大胡蜂）?, literally “giant sparrow bee”). When I was young the road to my grandfather’s’ house on our farm was very sandy for a 100 yards or so ,between two hay fields, just before getting to his house. It was always busy with Sand Hornets flying every where. Very large and scary looking but I don’t recall anyone ever being stung by them. Apparently they are aka cicada killers. 瀬畑雄三 , Sebata Yūzō, has many other friends to introduce you to. Some swim, some fly, some slither, other just stand there. Here’s one he has smiling for the camera. Then there is this 14:43 video about Sebata Yūzō , titled 山の翁, Yama no okina. That was posted on the forum a couple of years ago. Do you have any idea why 「日光テンカラ釣り」, `Nikkō tenkaradzuri’. 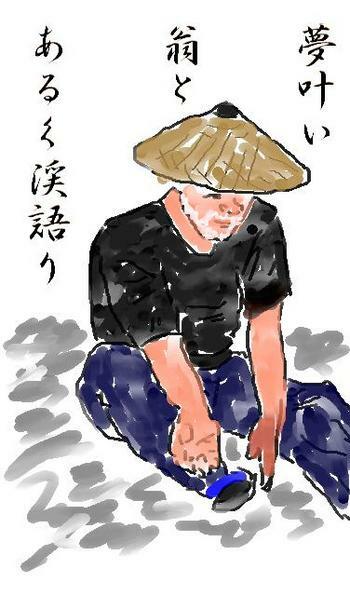 “Nikko Tenkara fishing”. Will also translate 「日光」as Nikko or Sunlight or Daylight or even Japan Light ? David, THANK YOU much for all this incredible research! Still no idea how you do it, but love it. What an amazing individual! It would be a real treat to meet him, and even better to spend a day or two wandering the forests, fishing, foraging, living with nature. I can’t wait to hear about your adventure with Sebata-san. I love hill climbing as much as mountain stream fishing. スーパー爺さん Sūpā jīsan’ ? Super Grandpa ?